Format Factory is a multifunctional free media converter that can convert between all popular video/audio formats like MP4, 3GP, MPG, AVI, WMV, FLV, SWF, MP4, WMA, OGG, AAC, etc. and rip DVD movies to video files. However, Format Factory only works in Windows (Including Windows 8) and there is still no plan for developing Format Factory for Mac. Well, you don't need to worry about how to rip DVD and convert video on Mac since there are numerous Format Factory alternatives for Mac. Here we will show you how to convert your DVD and video to any regular video/audio format easily with the best Format Factory for Mac alternative. This tool is Aimersoft Video Converter Ultimate for Mac. With it, you can fast rip DVD to any regular video/audio format like MP4, MOV, MKV, AVI, WMV, FLV, MP3, WMA, OGG, etc. and convert between all popular video/audio formats, including 3D video! In addition, this Mac app lets you download online video from YouTube, CNN, PBS, Yahoo, Google and more. Furthermore, it allows you to burn DVD from your favorite videos with custom DVD menus. Like Format Factory, it also comes with a built-in video editor that enables you to touch up your video clips in clicks! Now download this alternative to Format Factory for Mac (including Lion and Mountain Lion) and follow the instructions below to rip DVD movies and convert video/audio files. The primary window of this Mac DVD ripper and video converter is quite intuitive. You can complete converting DVD and video/audio in a few simple steps. You can also edit your videos to achieve the effects you want. To edit a video, click the 'Edit' item at the right of video thumbnail to open the "Video Edit” window, where video editing functions like trim, crop, adjust video effects, add watermarks, etc. are provided. Then you can select an output format for your DVD and video. Simply click the "iPhone 4” thumbnail (which is the default output format) to choose the desired format from the output list. Almost all popular output formats are available. 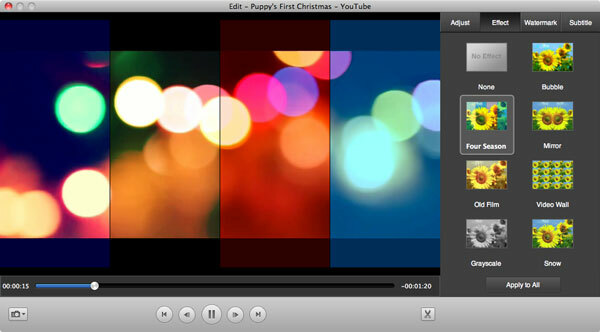 And 100+ video presets for devices and programs like iPhone, iPad, iPod, iMovie, PSP, etc. are provided. When all the settings are OK, click the convert button at the right bottom to begin ripping DVD movies and converting video files to your preferred video/audio formats.